When is the Right Time for a Tech Startup to Hire a CFO? For the past 25 years, Cliff Scheffel, a partner at Lancor, has worked with early stage, venture-backed startups in a variety of technology fields as a search consultant. Over this time, the environment has become increasingly competitive and complex, but one constant has been the need for management talent who can deal with the chaos, focus on the priorities and create a sense of order. One of the keys to getting this equation right is a qualified CFO. Recently in a conversation with Jeff Epstein, an Operating Partner with Bessemer Ventures and former CFO of Oracle and DoubleClick, Cliff and Jeff reflected on how often they are asked the question, “When is the right time for a startup to add a CFO to the Team?" 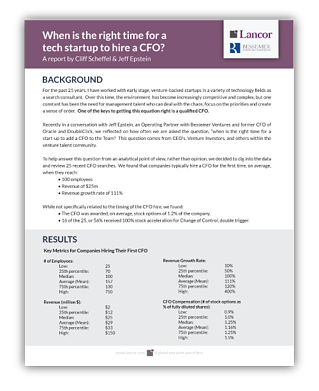 This report digs deeper into this question and analyzes a group of tech startups on the timing of their CFO hire – when and why. Complete the form on this page to view the full report.